Visit our new documentation site! This documentation page is no longer updated. Set your plans and prepare your environment to efficiently and effectively manage your customer data. The Arm Treasure Data platform offers features that support your work role. In addition to this article, refer to our CDP Readiness Checklist for more ways to prepare your environment and team to use Treasure Data to maximize the benefits of your collected customer data. Your work role affects how you plan and prepare to use the Treasure Data Platform. Depending on your job, you might use different part of Treasure Data’s platform. Determine the customer attributes and characteristics that you want to capture and analyze. Then set a plan for how you can use the data. For example, you might want to group all users that access particular web pages and perform particular actions. You might want to plan for campaigns for that particular segment of users. Add Audience Suite to your Treasure Data account. You then can review customer profiles, create segments, and apply predictive scoring to segments. You can then use personalization in messaging, campaigns, or other actions that you want to apply to your segments. Determine the applications that you want to enable to the Treasure Data platform. You can use our integrations to receive data from or send to your marketing application. Experiment with the collected information. 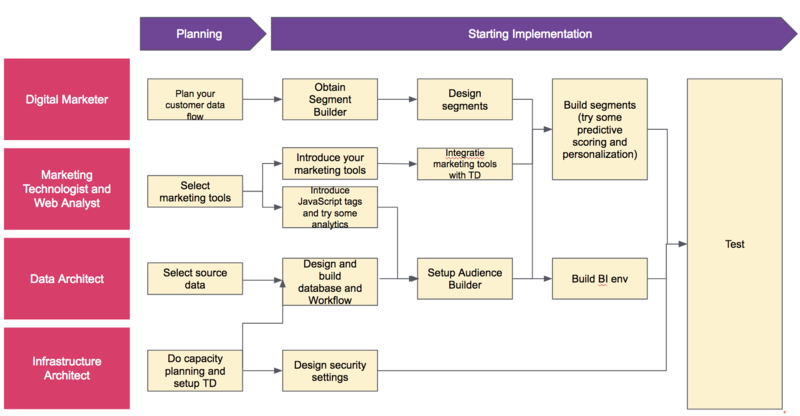 Work with your Data Architect to create a data model and work with your Digital Marketer to determine the attributes that would contribute to the most effective segments. Align use cases with your Key Performance Indicators. The more clearly you can define the desired business outcomes, the clearer your understanding of data that needs to be collected. Work with your team to determine information needs and potential sources. You can use our integrations to bring data into the platform. The Audience database serves as the data model for your customer data and workflow is used for the efficient collection, processing and management of the data. Audience Builder is a user interface and enables you to manage, unify, consolidate, organize, and link data from all your Treasure Data tables. Audience Builder is structured to process attributes, characteristics, and other data about your customers. From Audience Builder, you can generate a view of customer profiles and segments. Audience Builder, Treasure Workflow, and Treasure Data’s processing engines (Hive and Presto) are at the core of your business intelligence environment. Determine the configuration of your system. With a schemaless database, you are not restricted by data types. Our UI makes it easy to move from importing data to creating queries against the data to making the data part of a workflow or data model. You might already have several data systems. Determine how to bring the data from these systems into Treasure Data for integration, management, and processing. Assess the volume of data that you’ll be processing to determine the best plan for you. Define your security plan. Use utilization dashboards, audit logs and permissions to protect and control your TD account. You can restrict users and control use of resources. If this article is incorrect or outdated, or omits critical information, let us know. For all other issues, access our support channels.